ALBANY — The Broadalbin-Perth Patriots got individual victories from Jeffrey Shlomovich, Sean Meher, John Coddington and Jacob Galarneau along with a championship rum by their 1,600-meter relay team as they earned the team title at the Foothills Council Indoor Track Championship Sunday at the University at Albany. 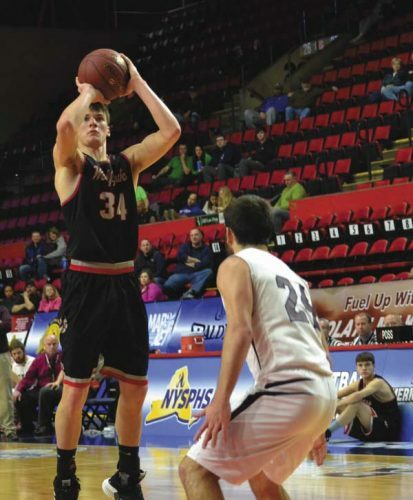 Broadalbin-Perth topped Scotia-Glenville 169-152 to win the championship, while Amsterdam was third with 72 points and Gloversville was sixth with 26 points. On the girls side Amsterdam was second to champion South Glens Falls, 125-99, while Broadalbin-Perth finished fifth with 59 points and Gloversville placed seventh with 12 points. Meher won the long jump championship with a leap of 19-06.25, was second in the high jump with a height of 5-08 and third in the 55-meter dash with a time of 7.04. Shlomovich won the pole vault, clearing the bar at 11-06 and placed fifth in the long jump with a jump of 17-05. Coddington turned in a throw of 47-01.5 to win the shot put and a throw of 53-04 to place second the Galarneau in the weight throw, which he won with a toss of 56-02.5. The Patriots 4×400-meter relay team of Michael Cichy, Jon Simmons, Kyle Henry and Wyatt Couperus took home the league championship with their time of 3:53.81. Simmons also placed fourth in the 55-meter hurdles with his time of 9.29 and Henry was sixth in the 300 meters with a time of 41.48. Nolen Neznek finished second in the triple jump for the Patriots with a leap of 38-02.25 and was fourth in the pole vault with a height of 10-0. Neznek also won the non-scoring 1,500-meter race walk with a time of 6:51.77. Niko Mancini finished third in the 55-meter hurdles (8.50) third in the triple jump (38-01.25) and fourth in the high jump (5-06). Ivan Roberts turned in a runner-up finish in the 55-meter dash with his time of 6.99 and was third in the 300 meters with a 39.86, while Aidan DeJong finished this in the shot put with a throw of 40-09.75 and was third in the weight throw with a toss of 52-08. Daniel Dylong finished third in the pole vault with a height of 10-06, while Zydain Jackson finished fourth in the 600-meter run (1:37.06), fifth in the 55-meter dash (7.20) and sixth in the 55-meter hurdles (10.40). Tino Mancini turned in a throw of 39-05.25 to finish fourth in the shot put, while A.J. Christopher was fifth in the 1,000 meter with a time of 2:59.33 and fifth in the 1,600-meter run with a 5:13.02. Hunter O’Dell placed fifth in the triple jump for B-P with a leap of 35-02.5, while Micah Smith placed fifth in the 3,200-meter run with his time of 11:19.40 and Connor Couperus was sixth in the 3,200 with a time of 11:25.53. Amsterdam’s 800-meter relay team of Peyton Ausfeld, Angel Sanchez, Robert Martinez and Marcos Santiago took home the championship with their time of 1:41.94. Santiago also won the 55-meter hurdles with a time of 8.22 and was fourth in the 300 meters with a time of 40.38. Sanchez also placed third in the long jump with a leap of 18-07.5 and placed fourth in the 55-meter dash with a time of 7.11 and Martinez placed fifth in the 300 meters with a time of 40.85. Chaun’J Ramos placed third in the 600 meters with a time of 1:36.82 and was fifth in the pole vault with a height of 10-0, while Trevor Dzikowicz finished third in the 1,600-meter run with a time of 4:48.98. Raymond Strauser led Gloversville with his third-place finish in the high jump, clearing the bar at 5-08 and placed sixth in the long jump (17-04.75) and sixth in the triple jump (33-09.75). Skyler Reed finished third in the 1,000-meter run with a time of 2:52.95 and fourth in the 1,600 meters in 5:03.61. Paul John Clet placed fourth in the triple jump with a leap of 36-02.5 and Ryan Issa placed fifth in the 600 meters with his time of 1:38.03. Lauren Santiago turned in a standout performance for the Amsterdam girls in their runner-up finish in the team standings. Santiago won the 300-meter dash with a time of 42.65 and the 600 meters with a 1:44.17. She joined with Kayla Sondrup, Gabby Stanavich and Skylar Grybos to win the 1,600-meter relay championship with a time of 4:33.37. Stanavich won their 55-meter hurdles with a time of 8.97 and placed fifth in the 300 meters with a time of 45.40. Sondrup added a fourth place finish in the high jump with a height of 4-08 and Grybos placed fourth in the 600 meters with a time of 1:55.91. Charli Beekman won the 55-meter dash for the Lady Rams with her time of 7.57 and was third in the long jump with a leap of 14-11.25. Emma Gomez placed fifth in the long jump with a leap of 13-11.75 and was fifth in the triple jump with a 30-00.5, while Mikayla Brown was fourth in the shot put with a toss of 26-10 and Sydney Szcezpanik was sixth in the event with a throw of 26-02. Josephine Smith placed fourth in the 1,000 meters for Amsterdam with her time of 3:48.86 and Gabby Feliciano was fourth in the 1,500 with a 5:41.61. Emma Kelly placed fifth in the 600 with a time of 2:01.88 and Samantha Kaminski rounds out the Lady Rams scorers with her sixth-place finish in the 55-meter hurdles in 10.35. Hailey Parrotti led the Broadalbin-Perth Lady Patriots with her victories in the long jump (16-04.5) and triple jump (34-07) and her runner-up finish in the 55-meter dash with a time of 7.74. Ava Tyler won the pole vault for the Lady Patriots with a height of 10-0 and placed third in the 55-meter hurdles with a time of 9.61, while Kayde Smith turned in a throw of 33-11.5 to finish second in the weight throw. Rhea Winter accounted for the Gloversville girls points in the meet with a third-place finish in the 300-meter dash in 44.88 and was third in the 600-meter run in 1;51.37. ALBANY — The Fonda-Fultonville boys and girls indoor track team earned runner-up finishes at the Independent League Indoor Track and Field Championships Saturday at the University at Albany. The Braves finished second to Green Tech 151-136 in the team standings, while the Lady Braves were second to Emma Willard 122-97. Shane Viscosi claimed a pair of Independent League championships. The sophomore distance ace won the 3,200-meter run in 11:39.56 and the 1,600 meters in 4:47.03. Myles Anderson won the 600 meters with his time of 1:34.30 and was second in the 300-meter dash with a time of 39.87. Carter Petersen topped the podium in the pole vault, clearing the bar at 11-00 and placed fourth in the 55-meter hurdles with a time of 9.48. Anderson teamed with Liam Viscosi, Brady Myles and Eric Hesch to win the 1,600-meter relay championship with their time of 3:57.89. Bennett Melita was second in the 3,200-meter run with his time of 11:43.38, while Gus Snow was second in the pole vault (7-06) and Adrian Claburn placed second in the weight throw with a throw of 34-09. Michael Lavoie finished third in the shot put with a toss of 34-03.75 and was fifth in the weight throw with a throw of 26-01.25. Michael Carpenter finished third in the pole vault with a height of 7-0, while Trevor Cline finished third in the 600 meters (1:36.94) and was fifth in the triple jump (35-05.75) and Liam Viscosi turned in a time of 9.21 to place third in the 55-meter hurdles. Charlie Susi finished fourth in the 1,000 meters with a time of 3:22.10, while Myles was sixth in the triple jump with a leap of 35-03.25 and Scott Valachovic finished sixth in the long jump with a 15-00.5. Emilia Vardi-Davidson placed second in the triple jump for the Lady Braves with a leap of 32-00.25 and was third in the long jump with a 15-07 and fifth in the 300-meter dash with her time of 47.29. Haley Clear finished second in the 3,000-meter run with her time of 12:42.72, while Guiliana Capparello finished third in the 55-meter hurdles in 10.16 and was fifth in the high jump with a height of 4-00. Sierra Rose finished second in the shot put with a throw of 29-09, while Eliana Montano finished fourth in the event with a throw of 27-10.5 and was fourth in the weight throw with a toss of 22-08.25. Marisa Mycek finished fourth in the high jump with a height of 4-0, while Kimberlee Snell finished fifth in the 600 meters in 2:00.41 and turned in a time of 3:46.5 to finish fifth in the 1,000-meter run. Julia Bagnardi placed fifth in the weight throw with a toss of 21-09 and Stella Williams finished sixth in the long jump with a leap of 13-02.